These heart hoops are made from solid 14k rose gold wire, or then hand forged and hammered into the shape of an open heart. Wear them and open yourself to give and receive more love in your life. Or give the gift of love to your love. These pink gold earrings are individually hand formed from 14k rose gold wire and come with a rubber stopper to hold them in place in your ear. They measure about 1 1/3 inches long and 1 1/4 inch wide. Rose Gold Spiral Pendant. 14k Solid Rose Gold spiral sun swirl necklace pendant. Real Rose Gold Circle Necklace. Round Hoop Pendant. Large Round Silver Gold or Rose Gold Hammered Circle Necklace Pendant. Simple Circle Necklace. OMG I love my heart shape earring, they are awesome. Thank you Aziza the price was great, shipping was awesome as well. I will buy here again. Rose Gold heart hoops. 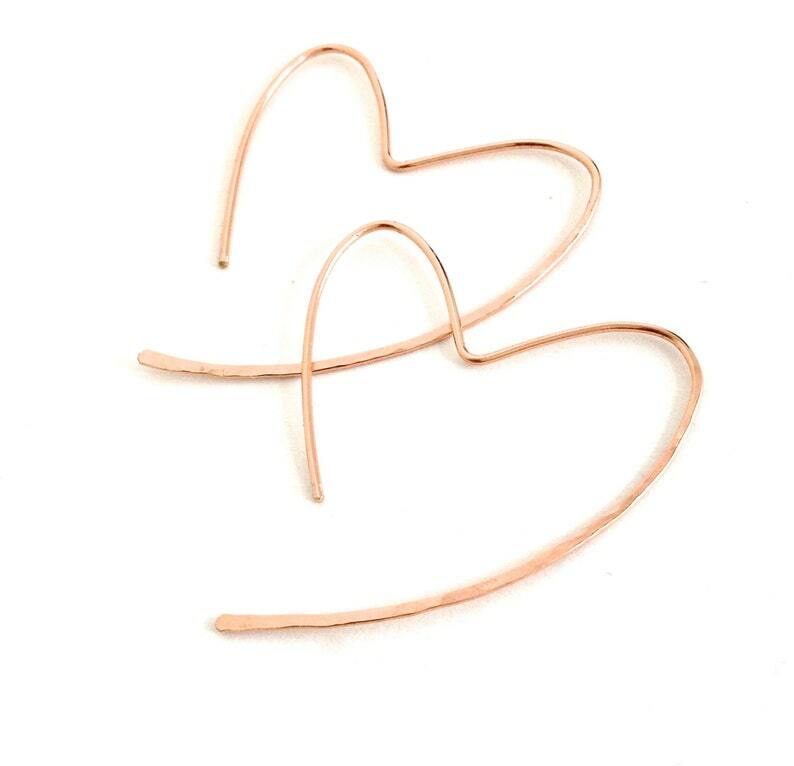 Heart Hoop Earrings in Rose Gold. Incredibly fast shipping and awesome earrings for my wife’s birthday. Large Rose Gold Round Hoop Earrings. Hand Hammered Shiny Large Rose Gold Filled Hoops. 2 inch Pink Gold Hoops.